Drug developer Auris Medical surged as much as 30 percent on Wednesday after a takeover announcement from Johnson & Johnson came out in the morning. But Auris Medical isn’t the company being bought by J&J. Auris Health is. Investors (and computer algorithms) mistakenly bought shares of Auris Medical instead of Auris Health, a robotic surgery company. 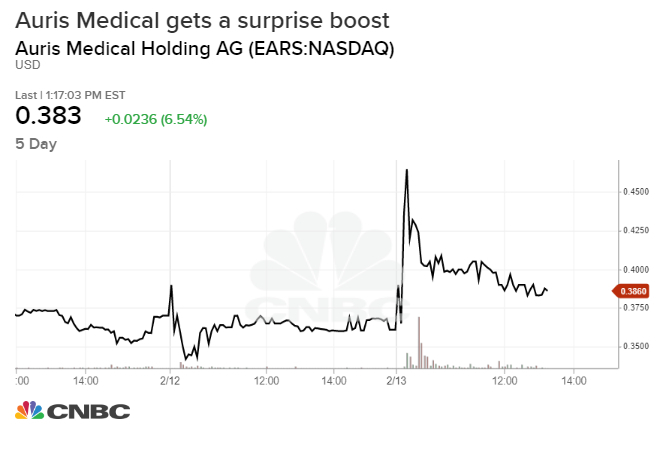 This was actually the second time that Auris Medical has gotten a surprise boost. The stock jumped more than 30 percent on Jan.23 when news came out that J&J was pursuing a deal with Auris Health. Auris Medical has a tiny market value of $12 million and is based in Zug, Switzerland. It makes treatment inner ear ailments. Auris Health is a privately held company and doesn’t have shares available for secondary trading. The mistake flies in the face of investors who argue the stock market is efficient and becoming smarter because of the prevalence of computer trading.